We will beat any competitor's advertised price by 5%! Call us today for more details. Various manufacturers have policies that restrict the public display of pricing. To comply with this policy, we only show our pricing after you add it to the cart. Go ahead click "Add To Cart", see your price and evaluate the value, there is no obligation to buy. Additional discounts are available on this product for qualifying government and education institutions. Please call us for additional details at 1-800-440-6723. 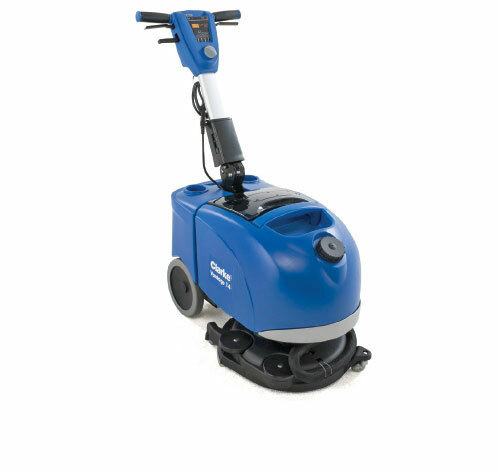 Combining innovation, reliability and performance, the Clarke Vantage 14 floor scrubber marks a breakthrough in daily scrubbing for small area cleaning. Patented Rotating Deck- Never skip those hard-to-reach areas again. The Clarke Vantage 14 floor scrubber’s integrated rotating deck enables complete scrubbing in both forward and backward directions, allowing operators to easily clean under and around obstacles. Simply push the machine forward; then when needed, easily flip the machine up to allow the deck to quickly rotate for reverse scrubbing operation. With fast and easy scrubbing and water pick-up in all directions, the Vantage 14 leaves a clean, dry surface to boost your facility’s appearance. Effortless & Reliable Operation- Employing brush-assisted operation, the Clarke Vantage 14 floor scrubber does the hard pushing for you, requiring significantly less physical labor. Adjustable water flow allows you to quickly switch between high or low flow settings, making it easy to tackle the job at hand. Say goodbye to annoying cords and limited scrubbing time and maximize your productivity with the Vantage 14’s fully-accessible, maintenance-free battery, which provides up to 100 minutes of scrubbing on a single charge. An onboard battery charger allows operators to charge the machine in any electrical outlet. Fast, Simple Maintenance- The Vantage 14’s easily-accessible, removable 3 gallon recovery tank and 2.5 gallon solution tank can be quickly filled, drained and cleaned away from the machine, ensuring less mess and minimal equipment maintenance. All machine components are accessible without the need for tools—including the squeegee, which features simple, one hand removal. When you’re done, simply fold the handle and transport the Vantage 14 to storage. For more information on our selection of Clarke floor equipment, call us 888-504-6441.